I started something else last night. A bit of January, the new Flip-it Bits by Lizzie Kate. I'm doing them on one long piece of fabric (the other half of my 32 ct. natural Glenshee that I'm using for my Sunflower Bellpull). I picked up the pattern yesterday at Silk Road Needlearts. They didn't have February, so I may have to get it Saturday at JoAnne Nantz's. I saw she had one there last weekend. I also got a couple sets of Q-snaps (8x8 & 11x11). I had some, but my oldest ds liked to use them to make shapes and musical instruments and when I went to put them together before we moved I couldn't get any to match, so I ended up throwing them away - don't ask me what happened to the missing pieces!! Well, baby is waking up - write later!! I saw a picture of these finished on one piece of fabric too - maybe it was the Silver Needle's site? Anyway, you're off to a great start! Funny thing...I am doing this too and as 1 long piece. I am still dong January and hope to have on my BLOG soon. Now to figure out how many spaces between months! Did you see the finished piece with all 12 mos on the lizziekate website? Do I see a SAL being started! 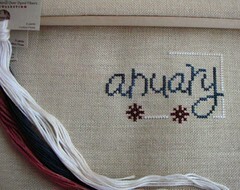 Pretty stitching of January! I like the linen you chose for it. I like these from Lizzie*kate. I am not sure if I will do them yet though b/c I am still trying to finish the 2005 flipits from her. Great start! Starting is so much fun, isn't it? Ann. I don't think there's a cure for startitis, but if you find one, please let me know! Off to a great start with January! !